Get them while they’re hot! The new line of NEDO tripods are now available for purchase at incredibly low prices. These tripods and accessories are designed specifically for 3D terrestrial laser scanning as well as land surveying equipment. The wide selection of NEDO products provides Laser Scanning America with innovative tripods of the highest quality and resilience. The NEDO aluminum tripods are built with highly robust materials to ensure reliability on site. The surveyor’s grade aluminum tripod features break proof levers, aluminum extensions legs, and brass hinge pins for extra stability. 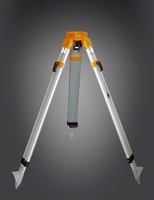 The heavy duty aluminum tripod and "Budget Line" tripod have similar features to the surveyor’s grade tripod and are constructed with the same tripod legs that can be easily extended with the clamping system provided. All three tripods are versatile and reliable for any project type and the price cannot be beat. All of NEDO’s wooden tripods are constructed with the finest European hardwood and are most suitable for total stations and theodolites. The large, aluminum tripod head and plastic coated wooden legs on the surveyor’s grade wooden tripod, fixed leg tripod, and wood fiberglass tripod create durability and consistent measurements on site. In addition to the new tripods, Laser Scanning America has added NEDO tripod accessories such as adapters, tripod stars, castors, and combi tripod feet. All of these accessories in conjunction with NEDO tripods will ensure accurate laser measurements for any project type.